UK water industry: How does it work? Multiple companies provide water in the UK, within regulatory regimes that differ between the nations. After thousands of people have been left without water in Northern Ireland because of an industrial dispute, BBC News looks in detail at how the system works. The water industry in England and Wales is regulated by Ofwat. The regulator has a duty to protect customers' interests, ensure that companies carry out their functions correctly and sets water prices. Ofwat says that there are 18 water companies in England and Wales, 10 of which have licences to provide water and sewage services while eight provide only water services. Following the privatisation of the water industry in 1989, most of the companies operating in England and Wales are privately owned. However, the companies' precise ownership structures differ. United Utilities, Dee Valley Water and Severn Trent Water are among a group of publicly-listed entities. Thames Water is privately owned with investors including the Australian Bank Macquarie and the BT pension fund. Water UK says that customers that consume more than five million litres of water are free to choose their water provider. From a regulatory perspective Wales is treated as part of the same jurisdiction as England, with water companies overseen by Ofwat. The main water and sewage company operating in Wales is Welsh Water, a private company limited by guarantee. That means that the company does not have any shareholders and profits are reinvested into the business. Welsh Water describes itself as the largest provider of water and sewage in Wales and the sixth largest in the UK. Other companies, such as Dee Valley, also operate in Wales. All water and sewerage services in Northern Ireland are provided by Northern Ireland Water. This was established as a government-owned company in April 2007. The Department for Regional Development, in the devolved administration, is the water company's sole shareholder. The Utility Regulator, which supervises the gas and electricity sectors, also regulates the water industry in Northern Ireland. Unlike the rest of the UK, where customers pay for their water provision, Irish households have their water funded by direct subsidy from the Northern Irish Assembly. There were plans to introduce customer-funded charges in 2007 but these have been deferred. 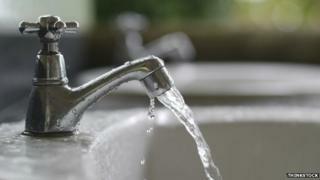 Non-domestic customers in Northern Ireland do not receive a government subsidy for their water provision. Scotland has one publicly-owned water and sewage company, called Scottish Water. The company provides water to Scottish households and is answerable to the Scottish Parliament. Customer charges are based on the council tax band of their home and are collected as part of the council tax payment. However, since April 2008 non-household customers, such as large companies, are free to choose their water and sewage provider. Water UK says that, as of 2013, 11 companies held a water and/or sewage licence in Scotland. Scottish Water acts as wholesaler to the retail market, where water services are available from licensed providers. The Scottish water industry is overseen by the Water Industry Commission for Scotland, or WICS.